VILLAS AND APARTMENTS TO RENT IN MIJAS, SPAIN. Welcome to our selection of holiday homes to rent in Mijas, Spain. Mijas is one of the white villages that are common in the Andalucian hills behind the Costa del Sol. It is one of the most popular with tourists because of its proximity to many of the main resorts, located only a few kilometres inland from Benalmandena Costa, Fuengirola and Torremolinos. Mijas has become popular with British ex-pats as a quieter place to settle than the coastal towns, though it remains thoroughly Spanish in appearance and many of the restaurants serve local specialities, not British exports. The area is also well known for the pottery that is produced there, which is sold in most of the souvenir shops in Mijas and the surrounding resorts. The old town is full of narrow and winding streets that become flights of stairs as you reach the peak of the village, at over 400 metres above sea level. It can be quite a difficult climb to the upper reaches of Mijas, especially in the heat of the summer months, but the oldest parts of the village are up here, as well as some of the best views of the surrounding countryside and the coast. The local tourist office runs guided walks in English around the highlights of the town, including the intriguing hermitage of the 'Virgen de la Pena', where an image of the Virgin Mary was supposedly found on the wall of a cave. There are several religious and cultural festivals held in Mijas throughout the year, including processions at Easter and a celebration of the three wise men in the days leading up to Christmas. The summer months see weekly flamenco shows, fireworks displays and music concerts in the church and the main square. Like many areas on the Costa del Sol, Mijas has plenty of golf courses to attract the serious or the casual player. In fact, Mijas has more courses than most, with seven currently open and a further four under construction. One of the biggest golfing and sporting resorts on the Costa del Sol, La Cala Resort, is close to Mijas, offering exclusive accommodation and restaurants, three 18-hole golf courses and a luxurious spa, where wives can relax while their husbands enjoy a round of golf! Non-members are welcome and there is a special ticket allowing you to play all three courses for a reduced fee. Other golf courses are located further towards the coast and the modern development known as Mijas Costa, which is mainly private homes and apartments rather than tourist accommodation. Looking for self catering holiday accommodation in Mijas? 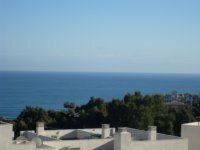 Then below is a selection of holiday apartments in Mijas and holiday villas in Mijas that can be rented direct from their owners. You can either click on each listing for further details or you can use our search engine on the left if you are looking for something in particular. Over the years, Mijas Golf course has become one of the most popular golf complexes in Europe. With its well looked after course and friendly atmosphere, a visit here is a must for all golfers. For those with a licence, Mijas offers an opportunity to explore the stunning scenery of Mijas on an Off-Road Motorcycle. All skill levels are accommodated for and there are a range of trails to see from dry, rocky hills to forests and rivers. For those who enjoy an adrenaline rush, Paintball may be the perfect activity. Several fields of play are available and offers lots of fun for all the family. Why not visit The Casa Museo? A fully restored museum featuring old-fashioned farming tools to show you how farmers worked years ago. There are also other farming tools, sculptures, paintings and other crafts to view at the museum. La Cala Resort. La Cala de Mijas. Mijas is a town in the province of Malaga. It is one of those white villages that are common in the Andalucian hills along the Costa del Sol. It is one of the more popular places to visit because it is located close to several main resorts.